Along with the Meet Rack, The Buffet Bar & Crock Pot places my two favorite dive bars in the country in Tucson. But while I love the Meet Rack for it's gradually revealing layers of weirdness, it is the crowd and the immediate vibe that make The Buffet a great dive. It has the most elemental features of a dive: it is old (est. 1934), it has a ramshackle decor with years of uninvited contributions from patrons, it has cheap and strong booze (with Coors the only beer on tap), and it was full of lively characters on a Sunday night. 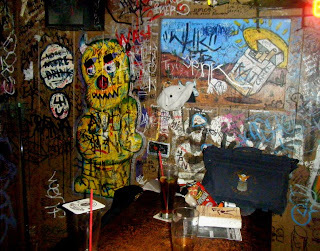 For Seattlelites, think of the Blue Moon, with a bit wider demographic and even more graffiti. 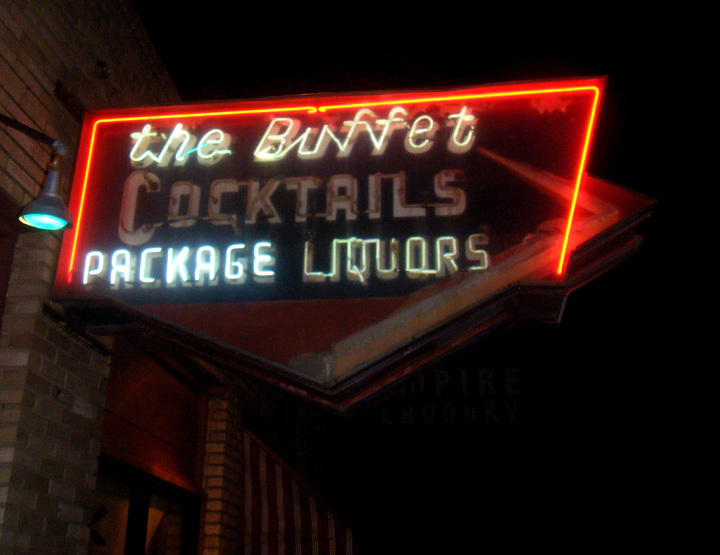 The Buffet is the oldest bar in Tucson, established shortly after prohibition, although The Shanty up the road a piece has the oldest liquor license (1937), as the Buffet's was suspended a few times over the years. And just as The Shanty is not a shanty at all, there's no buffet at The Buffet -- although there is a crockpot, which holds hotdogs. But it's a grand old place. The Buffet belongs in the Smithsonian's America History Museum. Its greatest attribute is the patronage. From hipster to 90-something raconteur cowboy, EVERYONE is represented, and everyone somehow fits in. THIS bar proves America is still a melting pot. OK well, everyone but the squeamish. It is 99.9% dive bar. It had been 100% until the city made it install bathroom doors. Yeah, it's that kind of place.